The release of Windows 8 and iterative updates has provided renewed purpose for touchscreen monitors. Regularly found as options in mainstream laptops and all-in-one PCs and, now, available as standalone screens, touchscreen and Windows 8 makes sense and is a key selling point for various manufacturers. Monitor expert Iiyama has more than 50 touch-enabled screens in its arsenal. Split into five categories defined by the touch method - resistive, saw, projected capacitance, optical and infrared - most are designed for digital signage or point of sale/point of information, with the best all-round screens using projected capacitance as the input method. Perhaps the best of this projected capacitance breed is the ProLite T2735MSC - a 27in, full-HD monitor featuring AMVA+ technology and 10-point touch capability. Pulling it out of the box reveals that the £450 T2735MSC is a substantial bit of kit. Weighing in at 8.3kg and also thicker than most regular PC monitors, it's really built like the proverbial tank. The surrounding bezel, incorporating a basic webcam, is large and very reflective, which can be off-putting, and the screen itself is also prone to magnifying reflections more than we'd like. 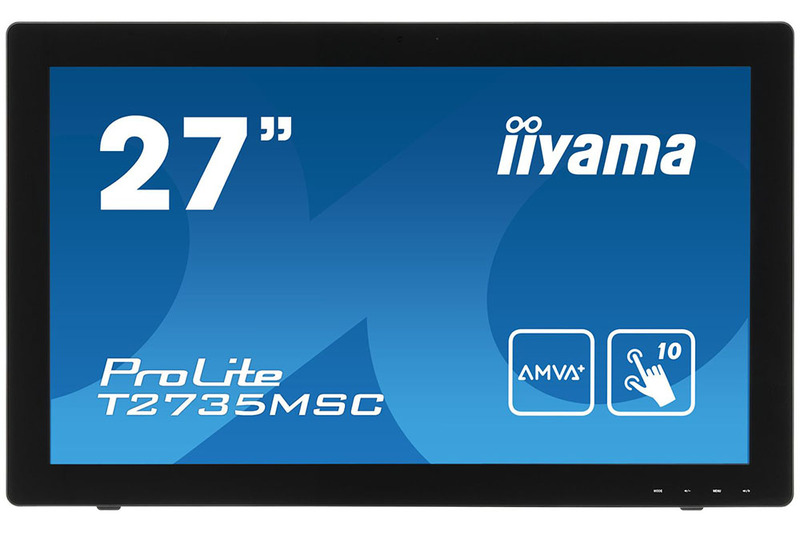 Iiyama uses a 1,920x1,080-resolution panel measuring 27in diagonally. Dot-pitch, at 0.311mm, is therefore quite large and immediately apparent when switching from our usual 2,560x1,440-pixel monitor of the same size. T2735MSC uses a tough glass coating that's impervious to minor spills, dust and the kinds of unintended abuse that any point of sale screen is likely to go through. The touchscreen is rated to a 7H scratch-resistant hardness, corresponding well with other commercial monitors using what is known as glass-on-top technology, where a sheet of glass, containing the capacitive sensors, covers both the underlying panel and the bezel. Such a design enables, for example, seamless swiping in from the sides, but the additional cost of housing a multi-point sensor array is financially detrimental insofar as it inflates cost to double that of a regular monitor. High transmittance is a key attribute of a good touchscreen. Iiyama's comes in at a quoted 87 per cent - a figure that's higher than average. Viewing it from head-on shows that while it's a little ways off a good PC-only screen in terms of vibrancy and colour reproduction, it's one of the better large-format, commercial-use touchscreens we've seen thus far. A kickstand pulls out from the rear and enables the monitor to be tilted from 15° to an almost-flat 70°. The stand is well-built and micro-adjustable such that any position can be attained with the minimum of fuss, though do be aware that a reasonable amount of force is required to pull it away from the screen from the get-go. Fixed in position, it's secure and solid, exhibiting no flexing when the screen is pressed vigorously. There's no height adjustment, mind, but that's less of an issue with these types of touchscreens. More importantly, there's the standard 100mm Vesa mount on the back. A couple of 2W speakers produce fairly tinny sound that lacks any real bass heft. Connectivity revolves around downstream USB 3.0 to the PC - which also acts as the conduit for the screen's touch ability when run on compatible OSes such as Windows 8 - two regular USB 3.0 ports, headphone connector, input for audio, HDMI (compatible with MHL technology), VGA and DVI. The I/O is very much in keeping with other Iiyama monitors. On-screen controls are accessed by pressing the touch-sensitive buttons on the bottom-right. The OSD, like previous Iiyama monitors, is rather small but does have all the configuration options we'd expect, and cycling through the seven submenus is intuitive; the OSD has to be navigated by the buttons rather than touch. Connected to a Windows 8.1 PC via both DVI and USB 3.0, the screen produces a clean image that feels ever-so grainy compared to non-touch monitors, most likely due to the glass-on-top coating. Blacks are solid, whites crisp and the shipping colours relatively neutral. The AMVA+ panel uses LED backlighting and is equipped with a 12ms response time and 5ms from grey-to-grey. It's fine for general web browsing and watching videos; the glossy, reflective screen is great for photos, but is tripped up when playing fast-motion games. Quoted with 178º viewing angles, text remains readable at up to 140°. The screen also does better than expected when subjected to direct sunlight, too, most likely due to the high-luminance settings it ships with. Running a battery of DisplayMate tests reveals good performance in the greyscale tests, with the screen able to distinguish between the 64 steps. Text is comfortably readable at the tiniest fonts while contrast is reasonable, if set a little too low out of the box. Uniformity, however, isn't great; the panel appears a little darker in each corner than in the centre. Placing all eight fingers and two thumbs on the screen, simultaneously, and moving images or pages around isn't the caveman-meets-fire moment is was a few years ago. Most premium tablets offer the same - Apple's latest iPads, for example - but it does work well on the Iiyama. The screen is sensitive and accurate at picking up all gestures. We remain dyed-in-the-wool keyboard-and-mouse users on PCs, but the speed at which windows can be moved, closed and organised, especially with Windows 8.1 as the backbone, had us accepting touch sooner rather than later. Power consumption is reasonable, too, with the monitor drawing roughly 40W when in use. The emergence of all-in-one PCs has stymied the success of regular touchscreen monitors for the PC. However, Iiyama provides users with standalone computers the opportunity of going down the touchscreen route by releasing a bevy of screens. Near the top of the stack is the T2735MSC, whose 10-point touch and large display make it easy to use. Adding the extra features required for a touchscreen inflates price to twice that of a regular monitor with the same basic specifications. That's a heck of a premium to stomach for the home user, where large-screen touch isn't a huge value-add right now, so we come away with the feeling that this screen makes more sense in point of sale and digital signage environments. Durable, precise and viewable in most conditions, it's worthy of consideration if you need a premium touchscreen monitor. 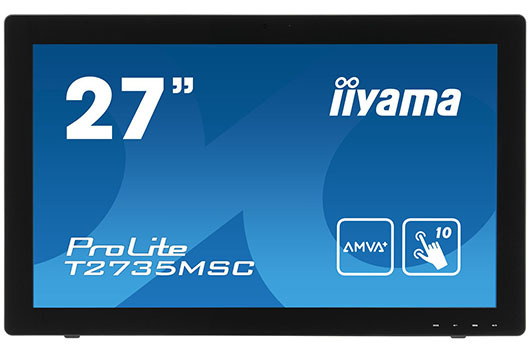 The Iiyama ProLite T2735MSC monitor is available to purchase from Scan Computers*.